I could probably get something drawn up. Would be a couple of weeks before I can get to stuff though, in the middle of moving house at the moment. 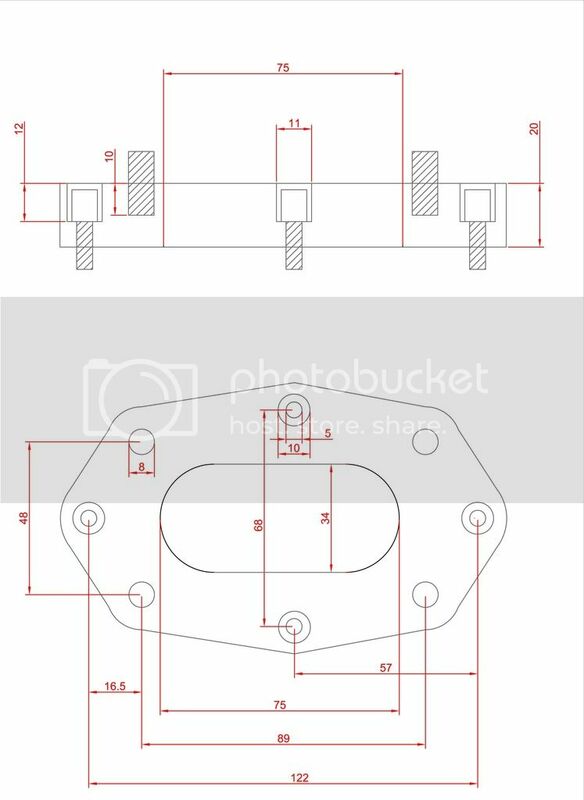 Might be able to get it as a cad file too, if not I can supply accurate enough measurements for someone to do it from. ben and james, had a look at how to do this myself the other day when I had my carb off the car and am half way through getting a cad file together. was wondering how either of you two mounted the brackets for throttle cable and return spring too the weber? For the throttle cable I made a bracket that fits between 2 of the rocker cover bolts. For the return spring I made a bracket that attaches to the scuttle panel. And I recessed the bolts for the flange otherwise they do get in the way. Cheers Ben! It seems I was well over engineering this... Will pop the drawings Up with dimensions for any one who wants them but I may just go about it a similar way to you. I am assuming you run the weber without the little black heater swapped over from the peirburg? I did tidy it up a bit more, that was part way through, but yeah I made it as simple as I could. I only had a drill, a jigsaw and a sander to do it with though. Can't remember if I re-fitted the heater thingy, probably not, this was all a while ago now and have since moved onto a 20v engine. I'll post the cad file tomorrow and you will see what I mean, was planning on sending it off to the cnc people and mounting all of the brackets too it as per the Webber baseplate. But seeing yours I may give it a go with hand tools and some luck aha. Is it 20mm? Meaning no need to relocate the rocker cover mounted air box bracket. Also any noticeable power gains / induction noise ? or just no more rubber gak where it should not be. When I made mine it was a direct replacement for the rubber flange so didn't have an issue with mounts as I still had the weber base plate. I noticed I had a snappier throttle response as I enlarged the openings so more air could get through. Right I've found the thread with photos of the alloy flange I made but for some reason I can't see the pics any more? If you can see the photos you will be able to see how it was made and the mods I made. cant see the pics either ben. this was my first plan. 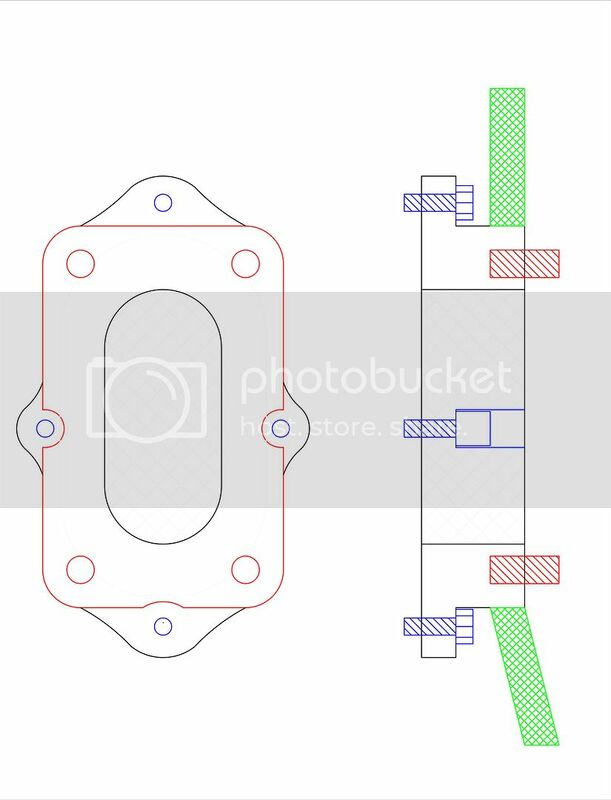 red is the studs that the carb mounts too and the shape of the flange to carb mounting face for my reference when drawing really. the mount is 30mm tall so will require the extened airbox mount on the rocker cover. That looks a lot better than my attempt. Well impressed. I used Allen headed bolts for all 4 that mount to the manifold, recessed just enough to get them below the surface. Mine was 20mm yeah, if you reduced yours from 30 to 20mm you would get around having to use the air box raiser and your Allen heads would still be within the mount. The aluminium is plenty strong enough, you could probably go a bit deeper and fit a shakeproof washer in there too, just to be on the safe side. Last edited by bengould on Thu Jan 07, 2016 11:07 pm, edited 1 time in total. jakeb wrote: cant see the pics either ben. They were attached to the post rather than linked to an external photo host so have possibly been trimmed from the forum with it being an old post. Is there any way to retrieve old photos like that because I don't have them any more and were pre photo bucket days? As regards the new cad flange design it looks good. ah it looks good on paper but not so easy to replicate, I only have access to basic hand tools and a friend with a pillar drill so a little out of my league maybe. Last edited by jakeb on Fri Jan 08, 2016 4:00 pm, edited 1 time in total.